Quality Henley work-grade T-shirt, with 3-Button Closure at the collar and long sleeves for added warmth in the winter or protection from the sun in summer. 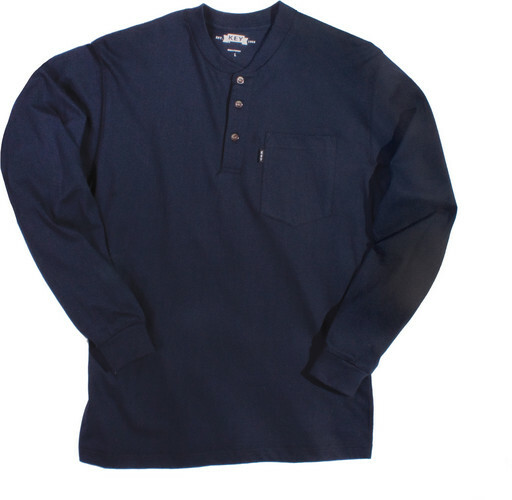 With the KEY Heavyweight Long Sleeve 3-Button Henley Pocket T-Shirt, you will experience style and comfort. The fabric is sturdy, yet soft and comfortable. The bone-colored, 3-button accent gives you style to wear out for a special occasion or can be casual enough to work in. A left chest pocket is added to conveniently store essentials and the hemmed long sleeves keep you warm during cooler temperatures. This Henley is offered in a variety of colors to suit your style. CHEST 34" - 36" 38" - 40" 42" - 44" 46" - 48" 50" - 52" 54" - 56" 58" - 60" 62" - 64"
HEIGHT 5'8" - 6'0" 6'0" - 6'3"